Robert Ramming’s wife says about him, “if you cut him, he’ll bleed dirt,” and in talking with him, it’s clear that he has a deep love of the land and all that it supports. Our interview began in the greenhouse, then Robert generously led me on a tour of the farm as we talked. Originally from Lompoc, the owners of Pacific Star Gardens, Robert and Debbie Ramming, have been farming on their property on Road 99 since the early 1990’s. Like many others in the mid-1960’s to mid-1970’s, Robert was influenced by the Back-to-the-Land movement. He had grown up on small family acreage, dabbling in gardening and small livestock, went into the tech industry with his brother in the ’80’s, then decided to leave to go back to working with the land. Robert’s farming journey has been one of lots of ideas, adventures, experimentation and adaptation, and it continues to this day. His first Pacific Star Gardens venture was with his dad in the early ‘90’s, building the greenhouse. Wanting to grow organic off- season tomatoes year round, he quickly discovered that the huge overhead with greenhouses added too much risk, so theirs became a propagation house. He also learned that tomatoes grown outside have much better flavor than the same type grown in a greenhouse. By the mid-90’s, he was growing vegetables outdoors, in particular, wholesale tomatoes. The name, Pacific Star Gardens, was chosen when the Rammings were planning to grow wholesale tomatoes to ship all over the Pacific Rim. Even though plans changed, the name stayed. Wholesale farming is difficult to make work on a small-scale farm such as theirs, so Robert’s wife, Debbie, suggested that they try retail farming. Their small roadside stand, located on Road 99 between Woodland and Davis, was run by their four kids and became an instant success. They were in an ideal location and customers loved their tomatoes. Then Debbie got them into Farmers Markets in Sacramento and they discovered that they really enjoyed connecting with their customers and seeing their customers’ faces light up at finding tomatoes and melons that smelled and tasted the way they remembered. Later, they added U-pick fruit and that has also been a big hit. An advantage to retail farming is that it can be done on a very small scale. And with the model that Pacific Star Gardens uses (mostly roadside U-pick), there are no marketing, advertising, transportation, packaging, distribution, or outside labor costs. I first learned of Pacific Star Gardens in 2002, when my daughter’s second grade class went there on a field trip to pick organic strawberries. Since then, I have stopped by many times to pick strawberries, as well as the other types of berries (boysenberries, olallieberries, marionberries) they grow. Although I have picked berries at Pacific Star Gardens many times, it turns out that I had only seen a small part of the farm. The “back twenty” of their 40 acres contains black walnut trees, a wildlife/irrigation pond surrounded by native grasses and shrubs, and a watering station for local birds, complete with a solar-powered pump built by the Rammings’ son. Eventually, they hope to put in a windmill to pump more of their own water. Attracted to the pond area are ducks, coots, Swainson’s hawks, kites, swallows, and redwing blackbirds. The philosophy at Pacific Star Gardens is to enhance their environment, to work with nature, and to create a more diverse local economy. Their farm certainly has done that. They rotate crops each year, have several orchards, rows of blackberries, wind breaks, a wildlife/irrigation pond, and chicken and turkey runs. While the term, “sustainable,” can mean different things to different people (to most farmers, it means that they earn enough to stay in business and have a decent quality of life), the original idea was to maintain healthy soil, keep the water source clean, and keep the soil in place to stop erosion. Over time it has also come to mean build up the soil, enhance habitat, and support wildlife. Robert’s plan for the future is for their farm to be truly sustainable - to provide good, healthy food, and eventually, their own energy. While their eggs are not currently organic (because the feed is not), they hope to grow their own chicken feed in the near future as they have grown grains before. They also hope to go into beer-making, adding bread and possibly goat cheese in the future. Farming certainly has had its share of adventures, from hail wiping out their strawberry crop, to the rabbits who’ve proliferated in the past few years after someone shot all the coyotes in the area, to the ground squirrels who try to make off with their chicks. To adapt, the Rammings have added an electric fence to keep out the rabbits and Debbie removes the chicks as soon as she can and moves them into the brooding house. As Robert and I talked, he told me about the different classes of soil. There are 8 classes, with class 1 being the “best of the best” and class 8 being totally unsuitable for crops (like cliffs). We have extremely good farming soil in our area – much of the soil in Yolo County is prime farmland (class 1 or 2) –and Pacific Star Gardens is fortunate to be in an area with class 1 soil. They are also open to having partners for the future. Fred Blum of Flowerstone Farm is currently using some of their land to grow his produce. Their goal is to have 2-3 farming families on their property. 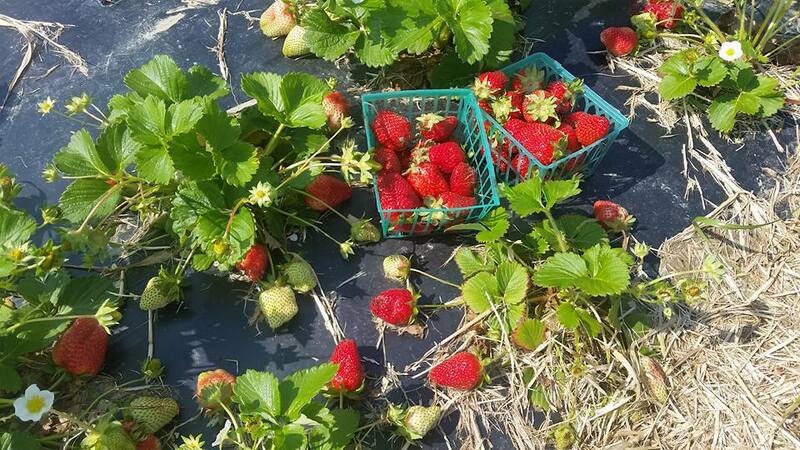 The farm currently offers U-pick organic strawberries, blackberries, and apricots, free-range eggs, (and through Fred, CSA boxes). They also occasionally raise meat chickens and try to have some turkeys available for their customers at Thanksgiving. Pacific Star Gardens is open all day, every day. Farm tours, arranged in advance, are available for a small fee. Pacific Star Garden strawberries are now ripe! It’s a fun experience for kids of all ages, plus they let you taste them while you’re picking too. Enjoy! May I See Your Tongue, Please? Fundraiser for Acupuncturists Without Borders! Help! It's a Scary World out There! News from the Third Annual Integrative Fertility Symposium! How Full is Your Reservoir? 3/4 or Running on Empty?